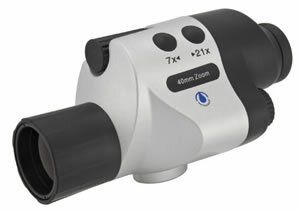 A unique spotting zoom spotting scope featuring an electric zoom so you can quickly and quietly change the power from 7x to 21x magnification. With multicoated optics and a waterproof construction this compact spotter is ideal for any application from birdwatching and nature study to getting closer to the action at sporting events. With a close focus of just 7 feet this versatile spotter can be used in the smallest garden for observing birds, insects and plants. Supplied complete with a carry bag and tripod adaptor, this spotter attaches directly to any standard photographic tripod.